The antibody is a rabbit polyclonal antibody raised against ADAM28. 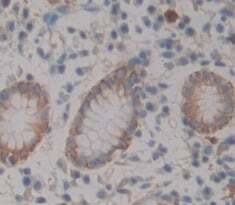 It has been selected for its ability to recognize ADAM28 in immunohistochemical staining andwestern blotting. Recombinant ADAM28 (Glu525-Lys774) expressed in E.coli. 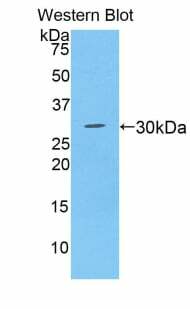 Small volumes of anti-ADAM28 antibody vial(s) may occasionally become entrapped in the seal of the product vial during shipment and storage. If necessary, briefly centrifuge the vial on a tabletop centrifuge to dislodge any liquid in the container`s cap. Certain products may require to ship with dry ice and additional dry ice fee may apply. NCBI/Uniprot data below describe general gene information for ADAM28. It may not necessarily be applicable to this product. ADAM28: May play a role in the adhesive and proteolytic events that occur during lymphocyte emigration or may function in ectodomain shedding of lymphocyte surface target proteins, such as FASL and CD40L. May be involved in sperm maturation. 2 isoforms of the human protein are produced by alternative splicing. 1. The data demonstrate that ADAM28 is expressed by epithelial cells of several normal organs, and suggest that ADAM28 plays a role in cell survival by suppression of C1q-induced cytotoxicity in bronchial epithelial cells.